New Zealand is a country whose population loves to gamble, a recent estimate stating that around 40% of adults in the country gamble at least once a week. This nation of just over four and a half million people enjoy gambling in high street betting shops, at bingo halls and at any one of the dozens of horse racing tracks scattered throughout the country. New Zealand also features six casinos, where players can enjoy favorites such as Roulette, Blackjack and the national favorite of ‘pokies’ (the continental name for slots). 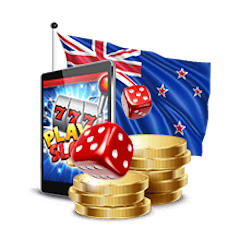 Many New Zealanders also enjoy online gambling, both in terms of sports betting and at online casinos. Here you’ll find a guide to casino gambling throughout New Zealand. I’ll start with a look at the online casino scene, explaining the legal situation and adding some advice for potential players. Then I’ll move onto a run-down of the six casinos based in the country, looking at the game selection you’ll be able to enjoy as well as entertainment and great food and drink. The legal situation regarding playing at online casinos is a little complex in New Zealand. Before 2003, the operation of casinos was not regulated and therefore players were to free to enjoy the games. However, that year saw the ‘Gambling Act’ passed, meaning that sites would not be allowed to operate in the country. This law is aimed at gambling operators and not the individual, which means that individuals can play at sites outside of the country. Unfortunately, not all sites will cater directly to NZ customers, some sites blocking play from the country and others not accepting New Zealand dollars. However, there is a selection of international sites which do welcome Kiwi players!!! Plus, these international sites will offer the very best in casino software so read on. You’ll find a great range of games, many of the sites specializing in slots (pokies make up 46.1% of all gambling in NZ, so this is ideal for gamblers from the country) offering games based upon blockbuster films, TV series and many other themes, some of the games featuring large progressive bonuses. As well as the slots you’ll find all of the traditional casino games feature, as well as innovative variations. An example of this is roulette, where you’ll the standard European roulette, French and American version, as well as bonus Roulette, Pinball Roulette, Mini Roulette and games featuring multiple wheels. The international sites are some of the best when it comes to online casinos, many offering a tremendous variety of slots, which obviously resonates well with their Kiwi users. These sites offer a great mix of both traditional casino games and new games, these new games either being completely original or variations on existing games. For example, you’ll be able to play both standard Roulette (European / American) and games like Mini Roulette, Bonus Roulette, and Multi-wheel Roulette. Some of the sites have taken the online casino one step further by offering a live casino. Here’ll you’ll be playing with a live stream of an actual live dealer at a table and gambling on the live action you see on the screen. This is the closest you’ll come to actually being in a casino and for many, the games are enhanced by the dealers generally being attractive females. They have easy deposits, generous roulette bonus and a great selection of single zero roulette games to play for real money online while enjoying the interaction with its Kiwi live dealers. The vast majority of online casinos are highly reputable and you’ll have a great gaming experience, although it does pay to be a little careful when signing up to a site. Unfortunately, the online casino industry is like many others, and on occasions, you’ll find a rogue site. To protect yourself from this, check that the potential site has the relevant licenses. Sites that have been in the industry for a long time are generally the safest. This casino features 180 gaming machines and a great variety of traditional table games, including Baccarat, Blackjack, and Roulette. The Grand bar and café feature delicious contemporary cuisine. Here you’ll find a the choice of over 500 gaming machines and 36 table games, featuring the classic games of Roulette, Blackjack and Baccarat. Seven restaurants, cafes and bars offer the best in cuisine and enjoy the live entertainment at the Mashina Lounge. A world-class casino with over a 100 tables and a large variety of gaming machines. Eat in one of the award-winning restaurants or stay in one of the 4 or 5 star hotels and enjoy the great array of entertainment. Featuring live entertainment, over 330 gaming machines and 23 separate table games. Relax in one of the six bars, restaurants and cafes and enjoy the live entertainment. You’ll even be able to play ten-pin bowling here. Here you’ll find 86 gaming machines as well as a great variety of table games including Blackjack, Roulette, Midi-Baccarat and Texas Holdem Poker. Enjoy the live entertainment and the great food and bar offerings. All of your favorite table games are available here as well as 86 gaming machines. Relax in the Wild Thyme restaurant and enjoy the live entertainment.